Interpretation of a find from a woman's grave (No. 501) in Birka. The silver original from around 950 A.D. is missing its center stone. 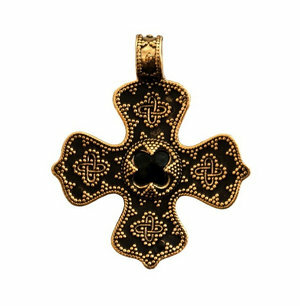 The cross from birka is one of the oldest pendant crosses in Scandinavia. This version is made of bronze with a centre stone of onyx. The back is flat.